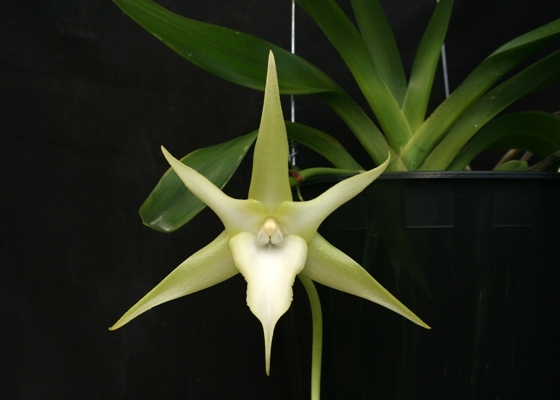 This amazing species from Madagascar has fragrant, waxy, light green turning to white, flowers six inches wide and over 12 inches tall. Equally amazing is its natural history. 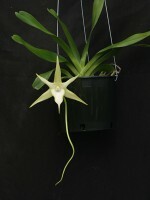 This is also known as Darwin's Orchid. Due to the length of its spur and its night fragrance, Darwin predicted that there must be a moth with a proboscis long enough to reach the nectar at the bottom of the spur. It wasn't until 41 years later that the moth was discovered.Intermediate growing. January blooming. Species from Madagascar.